1 Tuner + 1+ non-Tuner monsters Once per turn, during the Main Phase (Quick Effect): You can banish both this face-up card from the field and 1 random card from your opponent’s hand, face-up, until your next Standby Phase. Once per turn, during your opponent’s Standby Phase: You can target 1 banished card, return it to the GY. If this card is in your GY: You can target 1 other card in the GY, shuffle both that card and this card from the GY into the Deck. PSY-Framelord Omega makes it to #3 in our anniversary countdown for Synchros. Strong Level 8 Synchro that is easy to summon, the ability to take away a card from your opponent for a turn, face-up nonetheless, is a great effect. It takes away a card for a turn and lets you see one of the cards in your opponents hand, which may give away their strategy. You lose out on your Level 8 for the turn, but that may not matter if the game is far in. It is not a hard once per turn, so if you can summon more Omegas you can empty out your opponents hand. If you need something back in your graveyard for something like chaos fodder or Soul Charge/Monster Reborn, Omega can return any card to the grave during your opponents Standby Phase. If your opponent tries to Special Summon something during their Standby Phase from their banished zone, Omega can put that target in the grave and disrupt your opponents play. It is also worth noting, that if Omega targets a card that was banished by another Omega, and moves it to the grave, that card isn’t coming back to the players hand. You could use this tactic over and over if your Omegas survive. Finally, Omega in the grave can put a card and itself back into their respective decks. Another chance for you to disrupt your opponents plays, or recoup a resource in your grave. It also makes it possible to run only one Omega and get a lot out of it. Omega can disrupt your opponent in several ways, and that is huge. Alone, it is a strong boss monster that any deck running a Tuner can summon. Used to its full potential, Omega will take a card from your opponent for a turn, move a banished card to the grave, and put itself and a card back into the deck to be used again. I think this should have been my number one. PSY-Framelord Omega is a generic Level 8 Light Psychic-type Synchro Monster with 2800 Atk and 2200 Def. The stats are quite good and Omega can be summoned in any deck not just PSY-Frames. Also, his effects are mostly free. As a Quick Effect during a Main Phase you can banish Omega and a card from your opponent’s hand until your next Standby Phase. Non targeting hand removal is great. If you haven’t used that great effect Omega can target a banished card and move it back to a graveyard during your opponent’s Standby Phase. Also, free with only one part targeting a banished card. Finally, while in the grave Omega can target a different card in the grave to shuffle the target and Omega back into their respective decks. That effect targets but being able to disrupt your opponent’s grave is nice or moving a resource that you can search back into your deck is bonkers. PSY-Framelord Omega was and is too good to be true. I’m glad it got a reprint and is worthy of being in the top three of Synchro Monsters, possibly a top 3 of boss monsters as well. 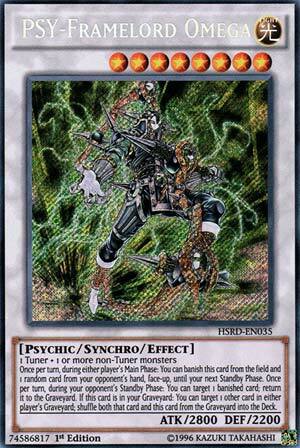 Number 3 here might be the best Synchro monster in the game today, but number 3 overall in the all-time rankings. Originally printed in Hi-Speed Riders, we have PSY-Framelord Omega. Omega is a Level 8 LIGHT Psychic Synchro with 2800 ATK and 2200 DEF requiring one Tuner and one or more non-Tuners. Stats are great on a Level 8, about average. LIGHT is a good type, and Psychic is solid. Once per turn, during either player’s Main Phase, you can banish this card and 1 card from the opponent’s hand until your next Standby Phase. This can be annoying to disrupt the opponent’s potential plays if you hit an important card. Also, it comes back to a Main Monster Zone if it left from an Extra Monster Zone. Omega is a great Synchro to put in the EMZ cause it can easily get out of it, easier than Stardust can. Also during your opponent’s Standby Phase, you can take a banished card and put it back in the GY. Several decks can make use of this, especially Zombies with Mezuki. I won’t go down the list, but putting cards back in the GY to use their effects again is amazing. Finally, when this card is in the GY, you can put this back in the Extra Deck to shuffle a card in either GY back into the owner’s deck. This is great for getting back a potential resource or stopping a monster in the GY your opponent can make good use of. Omega is a great card whose rating hasn’t really changed for me since release. Art: 4/5 Cool looking Machine-like card. My #3: Trishula, Dragon of the Ice Barrier. As should be evident by now (as with me not having Crystal Wing on here) I chose Synchro Monsters as a whole that were from the first wave and 5ds era of Yugioh on my list only, with an exception or two. (And I want to note I’ll be posting my Top 10 as a whole just for record come the #1 card). Having said that, PSY-Framelord Omega is and was a rather good Synchro Monster. Great for the Psychic player, or not, with generic summoning, being Light, and 2800 attack on a Level 8 body. Removing itself to remove a card from your opponent’s Hand (face-up) until your next Standby Phase, is amazing. True, they obviously get the card back, but not at a time when they can use it…Summon, Set, whatever, because it comes back during YOUR turn, as does Omega. But wait, during your opponent’s turn, you can conveniently send a removed card to the Graveyard. Thus, ideally keeping them from getting it at all. Plus, being able to recycle itself, as well as an opponent’s resource from the Graveyards back to the respective Decks, only furthers the abuse Omega can do. Throw in that he’s a beast to attack with as well, and you have a winner, now and then. I wouldn’t fault anyone at all for using this for power and/or destruction/removal still today. Next articleYu-Gi-Oh! Funko Pops – Available for Pre-Order!